The first stage of SpaceX's Falcon 9 rocket lands on a robotic ship at sea on April 8, 2016. Editor's note: This story was updated at 7 p.m. EDT (2300 GMT) Thursday (May 26) to reflect the launch delay. The private spaceflight company SpaceX hopes to land a rocket on a ship at sea for the third time in less than two months on Friday (May 27), and you can watch the exciting spaceflight action live. The landing attempt will take place during SpaceX's launch of the Thaicom 8 commercial communications satellite, which is tentatively scheduled to occur Friday at 5:40 p.m. EDT (2140 GMT) from Cape Canaveral Air Force Station in Florida. You can watch live here at Space.com, courtesy of SpaceX, or catch the action directly via SpaceX, at http://www.spacex.com/webcast or https://www.youtube.com/watch?v=zBYC4f79iXc&feature=youtu.be. The liftoff was originally scheduled to take place Thursday (May 26), but SpaceX pushed things back to check out a possible anomaly associated with the company's two-stage Falcon 9 rocket. "There was a tiny glitch in the motion of an upper-stage engine actuator. 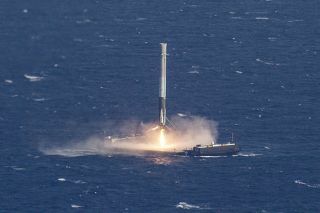 Probably not a flight risk, but still worth investigating," SpaceX founder and CEO Elon Musk said via Twitter Thursday. The rocket and spacecraft are healthy, company representatives said. SpaceX will continue to review data and work toward a Friday launch if everything checks out, the company said via Twitter Thursday. If all goes according to plan, the Falcon 9's two stages will separate a few minutes into the flight on Friday. The second stage will carry Thaicom 8 to orbit, while the first stage will come back down and attempt to land on "Of Course I Still Love You," one of SpaceX's two "autonomous spaceport drone ships," which will be stationed several hundred miles off the Florida coast. The 6,600-lb. (3,000 kilograms) Thaicom 8 satellite is headed to a distant supersynchronous transfer orbit; because of that long trip, the Falcon 9 first stage will be traveling very fast when it comes back down to Earth. "As with other missions going to geostationary orbits, the first stage will be subject to extreme velocities and re-entry heating, making a successful landing challenging," SpaceX representatives wrote in a statement. However, a Falcon 9 first stage pulled off a similarly difficult ocean landing earlier this month, during the launch of the JCSAT-14 communications satellite to geostationary transfer orbit. That May 6 milestone was the second ocean touchdown for SpaceX; a Falcon 9 also landed successfully on "Of Course I Still Love You" last month, during the launch of the company's robotic Dragon cargo capsule to the International Space Station for NASA. SpaceX also has one terra-firma touchdown to its name: In December, a Falcon 9 landed back at Cape Canaveral, during the launch of 11 satellites for SpaceX customer Orbcomm. These landings are part of SpaceX's effort to develop reusable rockets, a technology that Musk has said could slash the cost of spaceflight by a factor of 100.